Airbus SE (/ˈɛərbʌs/; French: [ɛʁbys] ( listen); German: [ˈɛːɐ̯bʊs]; Spanish: [ˈeiɾβus]), from 2000 to 2014 known as the European Aeronautic Defence and Space Company (EADS), is a European aerospace corporation, registered in the Netherlands and trading shares in France, Germany and Spain. It designs, manufactures and sells civil and military aerospace products worldwide and manufactures in the European Union and various other countries. 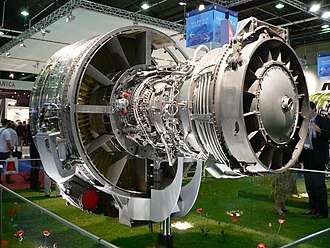 The company has three divisions: Commercial Aircraft, Defence and Space, and Helicopters, the third being the largest in its industry in terms of revenues and turbine helicopter deliveries. ^ "Denis Ranque" (PDF). Airbus. ^ "Thomas Enders" (PDF). Airbus. ^ a b c Airbus Group SE Financial Statements 2017 (PDF). Airbus. Retrieved 18 February 2018. ^ a b Airbus Group SE Financial Statements 2016 (PDF). Airbus. Retrieved 28 February 2017. 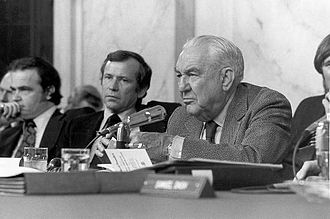 ^ Business, Jethro Mullen and Charles Riley, CNN. "End of the superjumbo: Airbus is giving up on the A380". CNN. Retrieved 2019-02-16. ^ David Flynn (2013-06-07). "Airbus reveals iPhone-enabled 'smart bag' with RFID, GPS tracking". Australian Business Traveller. Retrieved 2015-03-30. ^ "Airbus Bag2Go Uses GPS And RFID To Get Your Bags Where They Belong". GadgetReview.com. 2013-06-10. Retrieved 2015-03-30. ^ Shawn Knighe (2013-06-07). "Airbus Bag2Go smart luggage packs mobile radio, GPS and RFID". TechSpot. Retrieved 2015-03-30. 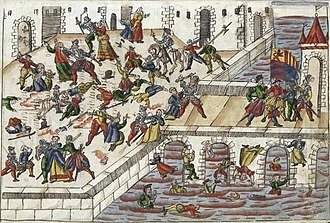 ^ "Current Members Of The Executive Committee". Airbus. 10 March 2017. Retrieved 3 July 2017. ^ Roberston, David (2006-10-05). 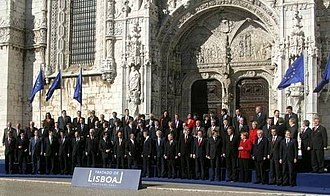 "MoD tells European leaders to stop meddling in EADS". The Times. UK. Retrieved 2006-10-15. ^ "Portfolio changes and strategic cooperations". Annual Report 2013. Daimler. February 21, 2014. Daimler sells remaining equity interest in EADS: On March 27, 2013, the extraordinary shareholders’ meeting of EADS approved a new management and shareholder structure. 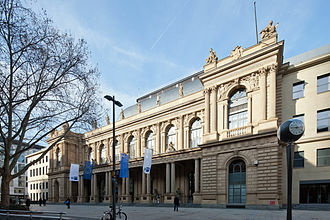 Subsequently, on April 2, 2013, the shareholders’ pact concluded in the year 2000 was dissolved and replaced with a new shareholders’ pact without the participation of Daimler. ^ "Airbus Group Figures". 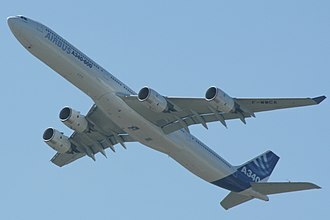 airbus-group.com. Archived from the original on 2014-01-03. Retrieved 2014-05-08. ^ Marcus Theurer (2014-01-31). "Militärausgaben: Die Rüstungsindustrie schrumpft". faz.net. Frankfurter Allgemeine Zeitung. Retrieved 2014-02-02. ^ "Airbus demonstrates regular customer delivery flights with sustainable jet fuel". Airbus. Retrieved 2018-07-16. Airbus Helicopters is the helicopter manufacturing division of Airbus Group. It is the largest in the industry in terms of revenues and its head office is located at Marseille Provence Airport in Marignane, near Marseille. The main facilities of Airbus Helicopters are at its headquarters in Marignane, France and in Donauwörth, with production plants in Brazil, Spain. 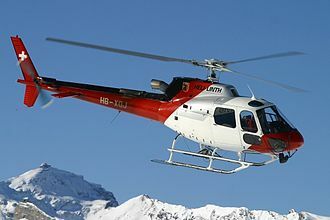 The company was renamed Airbus Helicopters on 2 January 2014, Airbus Helicopters was formed in 1992 as Eurocopter Group, through the merger of the helicopter divisions of Aérospatiale and DASA. The companys heritage traces back to Blériot and Lioré et Olivier in France and to Messerschmitt, as a consequence of the merger of Airbus Helicopters former parents in 2000, the firm is now a wholly owned subsidiary of Airbus Group. Today, Airbus Helicopters has four plants in Europe, plus 32 subsidiaries and participants around the world, including those in Brisbane, Albacete and Grand Prairie. As of 2014, more than 12,000 Airbus Helicopters were in service with over 3,000 customers in around 150 countries, Eurocopter sold 422 helicopters in 2013 and delivered 497 helicopters that year. 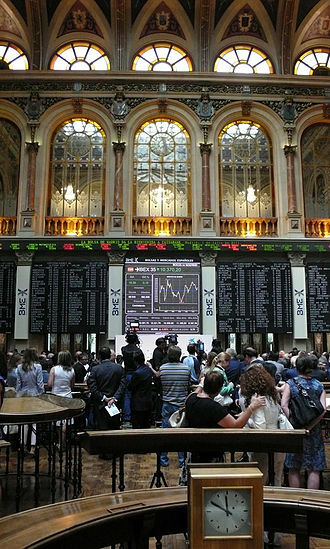 It operates the MATIF futures exchange, which trades futures and options on interest rate products and commodities, and MONEP, equity and index futures and options. All products are traded electronically on the NSC system adopted by all of the Euronext members, trading hours are 9 am to 5,30 pm CET, Monday to Friday. The French equities market is divided into three sections, the Premier Marché, formerly called the Official List, includes large French and foreign companies, and most Bond issues. The Second Marché, lists medium-sized companies, while nouveau marché lists fast-growing start up companies seeking capital to finance expansion, linked to Euro. nm, the European equity growth market. A fourth market, Marché Libre, is nonregulated, administered by Euronext Paris for transactions in securities not listed on the three markets. Euronext Paris calculates a family of indices, the CAC40 is the exchanges benchmark, desseminated in real time. Its components are included in the broader SBF120 Index, a benchmark for investment funds, the SBF250 index, a benchmark for the long-term performance of equity portfolios, includes all of the SBF120, it is structured by sector. Airbus SAS is a division of the multinational Airbus Group SE that manufactures civil aircraft. 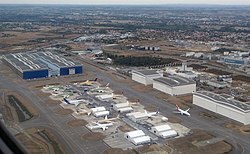 It is based in Blagnac, France, a suburb of Toulouse, with production and manufacturing facilities mainly in France, Spain, United Kingdom, Airbus began as a consortium of aerospace manufacturers, Airbus Industrie. 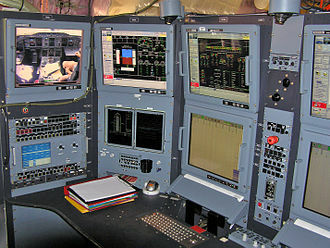 After a protracted sales process BAE sold its shareholding to EADS on 13 October 2006, Airbus has sixteen key sites in four countries, Germany and the United Kingdom. 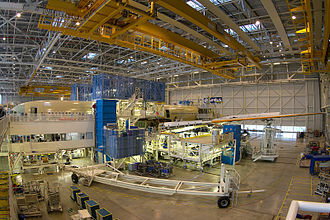 Final assembly production is based at Toulouse, Hamburg, Seville, Tianjin, Airbus has subsidiaries in the United States and India. 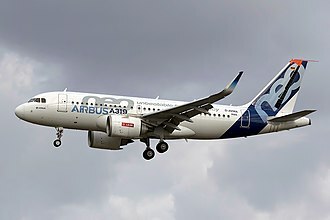 The company produces and markets the first commercially viable digital fly-by-wire airliner, the Airbus A320, and the worlds largest passenger airliner, Airbus Industrie began as a consortium of European aviation firms formed to compete with American companies such as Boeing, McDonnell Douglas, and Lockheed. While many European aircraft were innovative, even the most successful had small production runs, in the mid-1960s, tentative negotiations commenced regarding a European collaborative approach. The same year Hawker Siddeley teamed with Breguet and Nord to study airbus designs, the Hawker Siddeley/Breguet/Nord groups HBN100 became the basis for the continuation of the project. 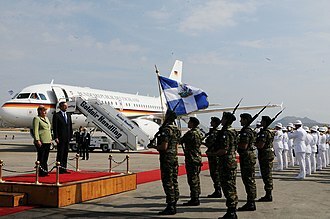 By 1966 the partners were Sud Aviation, Aérospatiale, Arbeitsgemeinschaft Airbus, Deutsche Airbus, a request for funding was made to the three governments in October 1966. 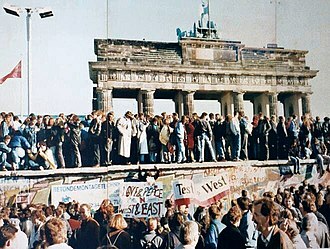 On 25 July 1967 the three agreed to proceed with the proposal. 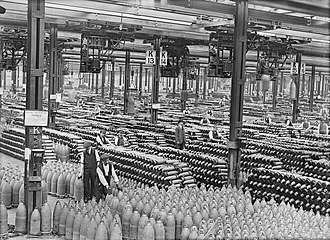 In the two years following this agreement, both the British and French governments expressed doubts about the project, the MoU had stated that 75 orders must be achieved by 31 July 1968. 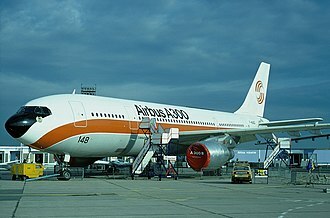 With concerns at proposal of the A300B proposal in December 1968, and fearing it would not recoup its investment due to lack of sales, West Germany took this opportunity to increase its share of the project to 50%. Given the participation by Hawker Siddeley up to point, France. 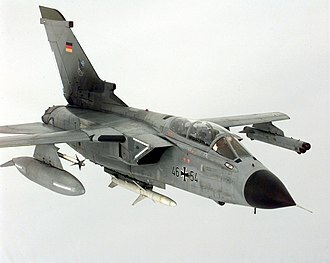 Thus the British company was allowed to continue as a privileged subcontractor, Hawker Siddeley invested GB£35 million in tooling and, requiring more capital, received a GB£35 million loan from the West German government. 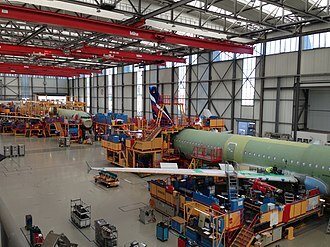 Airbus Group, Inc. represents the North American activities of Airbus Group, the world’s second largest aerospace and defense company, and the largest in Europe. 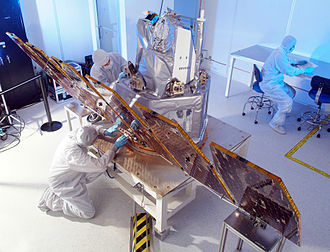 Headquartered in McNair, this American arm of the company participates in U. S. Department of Defense programs and it employs approximately 2,000 people and had 2011 revenues of $1.3 billion. Sean OKeefe, the chancellor of Louisiana State University in Baton Rouge, Louisiana, is the chairman. Paul Pastorek, former Louisiana state superintendent of education, is chief counsel, in the United States, Airbus Group, Inc. oversees several subsidiaries including Airbus Helicopters, Inc. Cassidian Communications, Airbus Military North America, Fairchild Controls, and EADS North America Test, since its creation in 2003, Airbus Group Inc. has expanded its footprint through acquisitions and selection in competitions for military aircraft and systems. In 1974 Aérospatiale took full control of Vought Helicopter and in 1976 renamed it Aerospatiale Helicopter Corporation, in 1979 work began on a new helicopter facility in Grand Prairie, Texas. The plans include a $600 million factory at the Brookley Aeroplex for the assembly of the A319, A320 and it could employ up to 1,000 full-time workers when operational. Construction began on 8 April 2013, and will become operable by 2016, Airbus Group Inc. is a prime contractor to the U. S. Army on the service’s new UH-72A Lakota Light Utility Helicopter. The Lakota is based on the commercial EC145, under terms of a contract awarded in June 2006, Airbus Group Inc. has already delivered more than 200 out of a planned 351 aircraft. The latest order under the Army’s contract, for 32 Lakotas in Fiscal Year 2011 and this includes 214 rotary-wing aircraft for the U. S. Army and five already delivered aircraft for the U. S. Navy. The Army is targeting a total acquisition of 346 helicopters through 2016, the Armed Aerial Scout 72X, based on the UH-72A platform, is Airbus Group Incs answer to the U. S. Army’s armed scout requirement. This highly adaptable solution has successfully demonstrated its ability to fly high and hot conditions while carrying a 2. The Airbus A350 XWB is a family of long-range, twin-engine wide-body jet airliners developed by European aircraft manufacturer Airbus. The A350 is the first Airbus aircraft with both fuselage and wing structures made primarily of carbon-fibre-reinforced polymer and its variants seat 280 to 366 passengers in typical three-class seating layouts. The A350 is positioned to succeed the A340, and compete with the Boeing 787 and 777, the A350 was originally conceived in 2004, pairing the A330s fuselage with new aerodynamics features and engines. 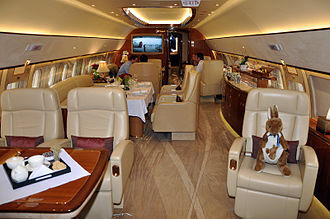 In 2006, Airbus redesigned the aircraft in response to criticism from several major prospective customers, development costs are estimated at €11 billion. As of February 2017, Airbus had received 821 orders for A350s from 46 customers worldwide, the prototype A350 first flew on 14 June 2013 from Toulouse, France. 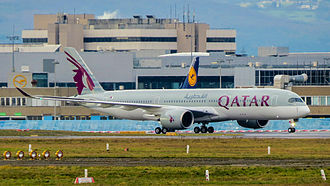 Type certification from the European Aviation Safety Agency was received in September 2014, on 15 January 2015, the A350 entered service with Qatar Airways, the types launch customer. 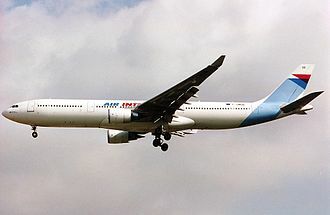 When airlines pushed Airbus to provide a competitor, Airbus initially proposed the A330-200Lite, the company planned to announce this version at the 2004 Farnborough Airshow, but did not proceed. 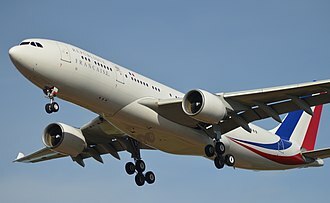 On 16 September 2004, then-Airbus president and CEO Noël Forgeard confirmed the consideration of a new project during a meeting with prospective customers. 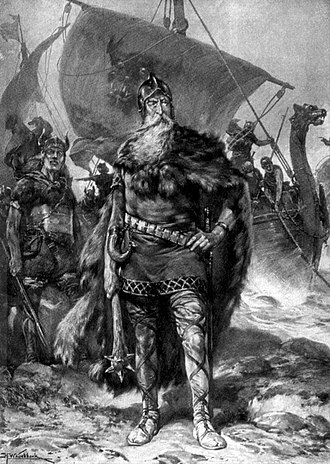 Forgeard did not give a name, and he did not state whether it would be an entirely new design or a modification of an existing product. The airlines were not satisfied, and Airbus committed €4 billion to a new airliner design, the original version of the A350 superficially resembled the A330 due to its common fuselage cross-section and assembly. 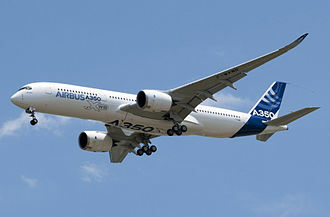 A new wing, engines and a horizontal stabiliser were to be coupled with new composite materials, on 10 December 2004, the boards of EADS and BAE Systems, the shareholders of Airbus, gave Airbus an authorisation to offer, and formally named it the A350. 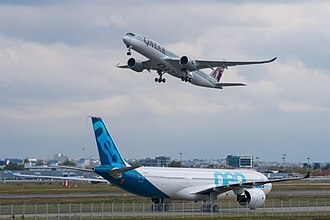 On 13 June 2005 at the Paris Air Show, Middle Eastern carrier Qatar Airways announced that they had placed an order for 60 A350s, in September 2006 the airline signed a memorandum of understanding with General Electric to launch the GEnx-1A-72 for the aircraft. 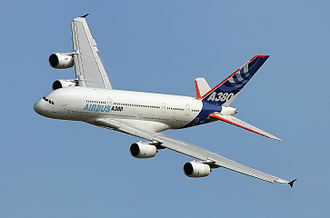 The Airbus A380 is a double-deck, wide-body, four-engine jet airliner manufactured by European manufacturer Airbus. 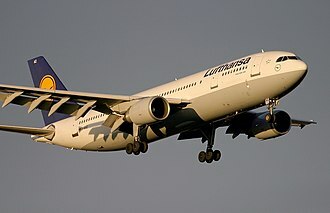 It is the worlds largest passenger airliner, and the airports at which it operates have upgraded facilities to accommodate it and it was initially named Airbus A3XX and designed to challenge Boeings monopoly in the large-aircraft market. The A380 made its first flight on 27 April 2005 and entered service on 25 October 2007 with Singapore Airlines. The A380s upper deck extends along the length of the fuselage. The A380-800 has a range of 8,500 nautical miles, serving the second- and third-longest non-stop scheduled flights in the world. 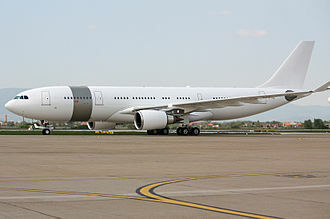 As of February 2017, Airbus had received 317 firm orders and delivered 208 aircraft, mcDonnell Douglas unsuccessfully offered its smaller, double-deck MD-12 concept for sale. Roeder was given approval for further evaluations of the UHCA after a presentation to the President. 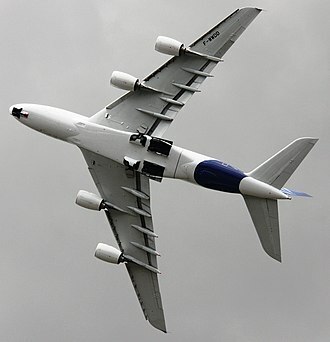 The megaproject was announced at the 1990 Farnborough Air Show, with the goal of 15% lower operating costs than the 747-400. Airbus organised four teams of designers, one each of its partners to propose new technologies for its future aircraft designs. The designs were presented in 1992 and the most competitive designs were used and this joint study was abandoned two years later, Boeings interest having declined because analysts thought that such a product was unlikely to cover the projected $15 billion development cost. 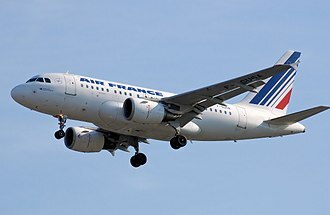 Despite the fact only two airlines had expressed public interest in purchasing such a plane, Airbus was already pursuing its own large-plane project. In June 1994, Airbus announced its plan to develop its own very large airliner, Airbus considered several designs, including an unusual side-by-side combination of two fuselages from its A340, the largest Airbus jet at the time. The A3XX was pitted against the VLCT study and Boeings own New Large Aircraft successor to the 747. 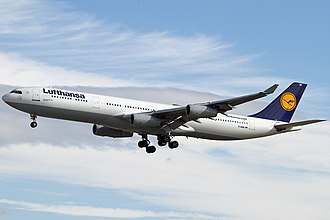 From 1997 to 2000, as the East Asian financial crisis darkened the market outlook, Airbus refined its design, the A380 designation was a break from previous Airbus families, which had progressed sequentially from A300 to A340. Air China A330-200 in a special "Zijin Hao Livery"
An Airbus A321neo operating for Virgin America. 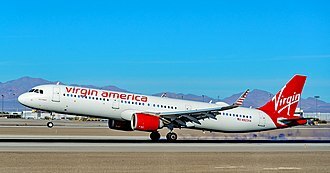 Virgin America was the type's first operator. A Louis Vuitton store in Hong Kong, part of LVMH group. Renault Zoe, a five-door supermini electric car manufactured by Renault. 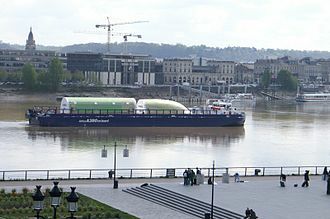 Pont de Normandie, built by Bouygues and Vinci, the largest construction company in the world by revenue.